Klipsch Audio presented Classic Album Sundays at Bestival 2014, where Joe Boyd discussed the album “Liege and Lief” by Fairport Convention using Klipsch La Scala speakers. Boyd is a record producer and writer who formerly owned Witchseason production company and Hannibal Records. His impact on the recording careers of some of the world’s greatest bands is immeasurable. Groundbreaking British DJ John Peel once called him “the best kept-secret in the world of music,” but Richard Thompson has been flatpicking raging guitar solos for more than 50 years. Groundbreaking British DJ John Peel once called him “the best kept-secret in the world of music,” but Richard Thompson has been flatpicking raging guitar solos for more than 50 years. He burst onto London’s swinging music scene in 1967 as the teenage singer and guitarist for Fairport Convention, the seminal folk-rock band that married traditional English songs with an infectious rock groove. In the ’70s, he began singing hypnotic duets in harmony with his then-wife Linda; their best-known album, I Want to See the Bright Lights Tonight, was released in 1974. In the early ’80s, the singer-songwriter went solo and has regularly put out albums ever since. Though he remains relatively under the radar, the press takes regular notice of him: In 2011, Time magazine listed his 1991 fingerpicking masterpiece “1952 Vincent Black Lightning” as one of their All-TIME 100 Songs, and in 2015, Rolling Stone put him at #69 on their list of the 100 Greatest Guitarists. He was appointed an Officer of the Order of the British Empire (OBE) in 2011 for his musical contributions. Last September, he released 13 Rivers, his 18th solo album. It features 13 thundering, mostly minor-key songs that Thompson vaguely describes as having been written during a dark time in his life. He brings the Richard Thompson Electric Trio, with drummer Michael Jerome and bassist Taras Prodaniuk, to the Lensic Performing Arts Center on Thursday, Feb. 14. Pasatiempo reached him by phone at his rented house in New Jersey, where he was resting up in advance of his 2019 tour. Pasatiempo: The songs on your new album have been described as having a “grim urgency” and an “unflinching gaze,” which could also characterize much of your songwriting over your career. In the first verse of the opener, “Storm Won’t Come,” you sing, “I’m longing for a storm to blow through town/And blow these sad old buildings down/Fire to burn what fire may/And rain to wash it all away.” Are these songs for troubled times, or is this just business as usual for you? Richard Thompson: It’s not that bad if you really listen to it. [laughs] I don’t think I’ve written literally about anything. I’ve been in this parallel world of song fiction. I’m sure all these traumas that my son has been through are reflected in there. [Above] John Peel interviewing Sandy Denny, singer of Fairport Convention, broadcast on BBC Radio One from 27th December 1969. [Below] Sandy is interviewed on John Peel’s ‘Sounds on Sunday’ in January 1974 and also interviewed for BBC Manchester in 1974. Both interviews are to promote her album “Like an Old Fashioned Waltz”. 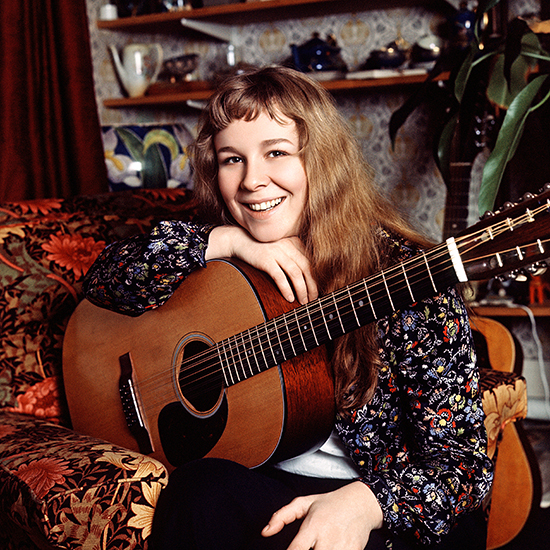 Dave Swarbrick, John Renbourn, Gerry Conway, Martin Carthy and Dave Mattacks share remembrances of the late Sandy Denny.